Where 2010’s Autumn Sky didn’t really stick, Dancer and the Moon does. That in itself is just about all you need to know about the brand new Blackmore’s Night record, but since you can’t review an album with only one sentence (then again, who says you can’t? ), perhaps I should elaborate a little. Dancer and the Moon is the eighth studio album by the folk/rock duo that is guitar-god Ritchie Blackmore and his long-time muse, Candice Night, not counting the two live albums they have released, or the holiday-centric Winter Carols. Dancer and the Moon also features a surprising amount of electric guitar work, and there’s an almost tangible sense of fun throughout the entire album. It’s a sense of fun that was sorely missing on the far too calculatingly composed and ultimately rather bland Autumn Sky. Now, whether I would open an album with a cover version of Randy Newman’s I Think it’s Going to Rain Today, is an entirely different matter. Not only because I don’t care much for the song, but also because it does nothing to bring out the qualities of Blackmore’s Night. Things quickly start faring better after that, though, with folky songs like Troika or the infectious title track. Candice once again really shines as a singer, and I keep being amazed by how diverse and impressive her vocal work have become since the days of Shadow of the Moon. On the other side of the musical spectrum, of course, we find the acoustic instrumentals where Blackmore can show off his playing skills in little (but impressive) renaissance ditties. Between the instrumental tracks and the happy-go-lucky folk stuff, we also find two immensely impressive cover versions of Uriah Heep’s Lady in Black and The Temple of the King from Blackmore’s own days with Rainbow and the late legend Ronnie James Dio. Both songs are reworked to fit somewhat better in Blackmore’s Night’s musical style, and both songs have Ritchie bringing out the old, trusty fender again. Especially the rendition of Temple of the King is amazing, and takes the song to a whole new level, although no-one can ever top Dio’s vocals on the original. Other highlights include The Moon is Shining (Somewhere Over the Sea), the decidedly Rainbow-esque rocker that is the companion piece to the far more intimate Somewhere Over the Sea (The Moon is Shining), featuring some mighty impressive work on the strat, and the closing, bitter sweet goodbye to Jon Lord, who passed away last year after a bout with cancer. 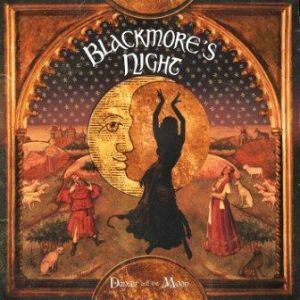 If you weren’t that impressed by the very acoustic renaissance folk of the earlier albums, Dancer and the Moon might just be able to turn around your opinion on Blackmore’s Night. It features by far the heaviest, most rocking stuff to date, and finds that perfect balance between that ye olde minstrel type material, cover songs and contemporary pop rock. It’s still the same Blackmore’s Night it has always been, but the songs are a little edgier this time round. Dancer of the Moon is a very solid album that surely has a song on it for everybody, be they renaissance faire enthusiasts or fans of the more classic rock of old. This entry was posted in RP and tagged Autumn Sky, Blackmore's Night, Candice Night, Dancer and the Moon, review, Ritchie Blackmore. Bookmark the permalink.